So you’ve probably noticed that I’ve been reading a lot of cat books lately. 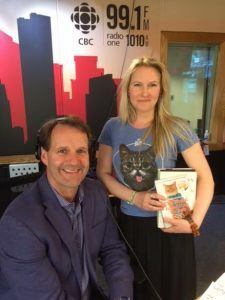 I wasn’t just doing this because I REALLY LOVE CATS-I was doing this in anticipation of my cats book segment for the CBC this past week. I feel like book lovers and cat lovers are many times (but not always!) one and the same, so it made sense to search out some feline-friendly reads for my loyal listeners. Oscar wonders why they forgot Memoirs of a Superior. Send them some blog links and your YouTube channel and I’m sure that they would be happy to include all your stories.